Gobby is an affectionate name given to my maternal grandmother, who passed away in 1999. After she died, my aunt made a cookbook out of Gobby's recipes and passed the books out to the women in the family. I love the book--some of the recipes are more modern, and some are very old. This recipe is my favorite! The cream cheese and sour cream mixed together is a great combo. 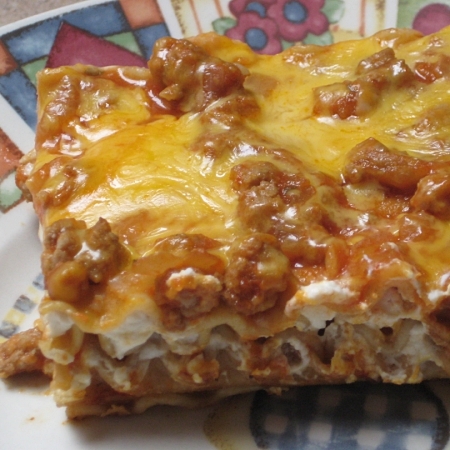 I've even used these ingredients to make a lasagna, which makes the lasagna unique with the sour cream. Lots of compliments when I made that for a get-together! Cook the pasta according to package directions. Cook the onions and beef in a skillet with the olive oil until beef is browned. Drain, and add the tomato sauce. In a medium bowl, combine the sour cream and cream cheese until smooth. To assemble casserole: first layer half of the pasta, then half of the cream cheese mixture, then half of the beef mixture. Repeat layers. Top with cheddar cheese. Bake at 350 for about 30 minutes until hot and cheese is melted. Thank you, thank you and your grandma for this recipe... I made it yesterday for a party (no meat), and both adults and kids couldn't stop talking about how good it was.